Late Friday night, Howard Stringer of Sony may have accidentally revealed a budding relationship between Sony and Apple. At a Wall Street Journal speaking event the CEO mentioned that one of Sony's best camera sensor factories in Sendai, Japan was damaged by the earthquake and subsequent tsunami. The damage, he noted, would delay shipments of sensors to Apple for its iPhones or iPads. The fact that he specifically mentioned iPhones is leading Apple-watchers to believe that Apple is ditching OmniVision, the company currently producing the 5-megapixel sensor on the iPhone 4, in favor of Sony, which has made 8-megapixel camera sensors for the Sony Ericsson smartphones, including the Xperia Arc. 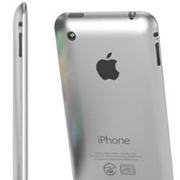 Camera on a current edition of the iPhone; could it hit 8 megapixels in the next release? Rumors last September suggested that Samsung would make an offer for OmniVision but nothing ever came of it; perhaps this slip-up gives credence to a merger of Sony and OmniVision. Or perhaps Apple just wanted the best camera to compete with what's new on competing smartphones, and Sony prudently picked up another business opportunity despite its phones being in direct competition with Apple's. At any rate, if Stringer's comment means what the blogosphere thinks it means, we certainly won't see an iPhone 5 this summer, but when it does arrive it'll have a nice 8-megapixel sensor. Needless to say, some Apple, Sony, and OmniVision PR people are going to be working very hard on Monday, dealing with questions in the wake of this hint.